Anthony Laffor has taken the Brazilians to glory with one match to spare - the eighth time that the Pretoria base club has been crowned South African champions. After Saturday's 3-1 home win against Ajax Cape Town, Downs are currently on 59 points with Orlando Pirates sitting second place on 52 points. 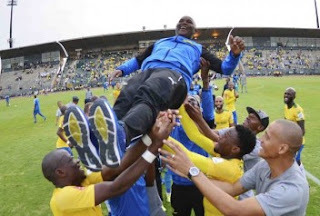 It was Mosa Lebusa that threatened the home side Championship in the early minutes, a goal that put Cape Town in front for a short period, Mosimane’s men fought back through Khama Billiat, Ricardo Nascimento and Sibusiso Vilakazi to claim victory and secure their eighth title in the PSL era. Laffor, who has suffered lots of injuries this season was introduced in the game 88 minutes for Billiat to help guide the team to glory. Benni McCarthy came in faster to congratulate Anthony Laffor side for their efforts in clinching the title. “It was thoroughly deserved, they were the most consistent team. When you have a squad like that, how can you not be consistent? 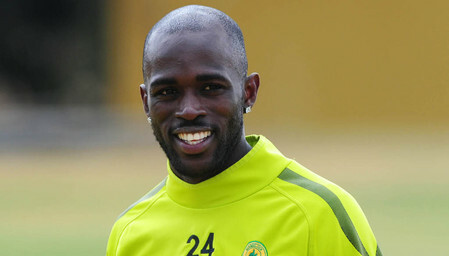 They have shown class, efficiency, so they deserved to win,” said the Cape Town City coach. The Absa 2017/2018 Premiership season will wrap up with a final round of eight matches played simultaneously on May 12.